Apache Solr 5.x is used in this tutorial; configuration for Apache Solr 4.x and 6.x could be slightly different. If not already created, create a directory /solr to install the software and set its permissions to global (777). Download the Apache Solr 5.x solr-5.3.1.tgz file and extract the tgz file to the /solr directory. Download Java 7 from http://www.oracle.com/technetwork/java/javase/downloads/jdk7-downloads-1880260.html and extract the gz file to the /solr directory. To use HDFS for storage, Hadoop 2.x is required. 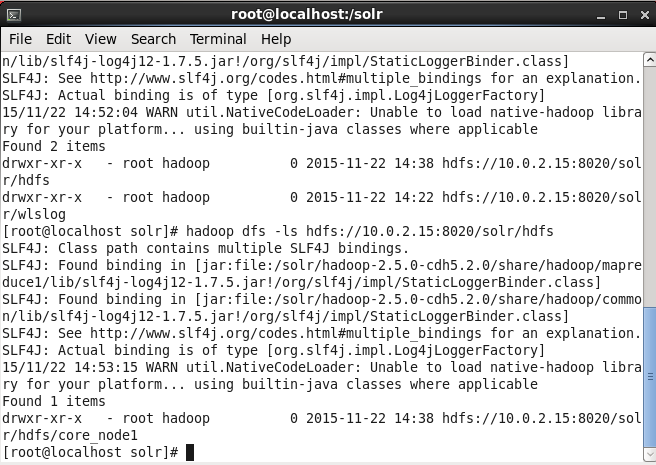 Download Hadoop 2.5.0 CDH 5.2 and extract the tar.gz file to the /solr directory. Create symlinks for the Hadoop bin directory and the conf directory. Symlinks, also called symbolic links, are references or links to other files and are required due to the packaging structure of the Hadoop binaries. Set the environment variables in the bash shell for Apache Hadoop, Apache Solr, and Java. If the storage is to be based in HDFS we must first create a Solr collection and not create a Solr core. A Solr core gets created implicitly when a collection is created. 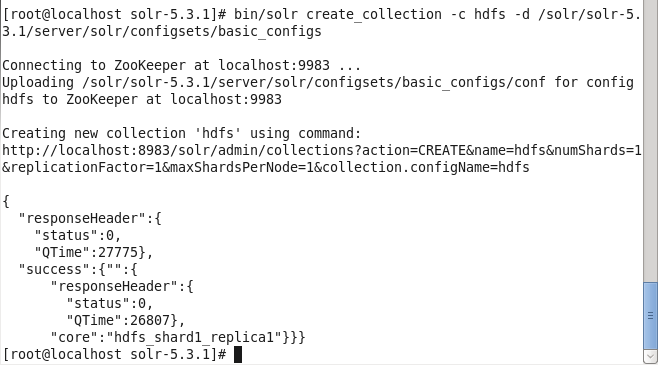 Create a collection called “hdfs” with the Solr instance configuration from the basic_configs using the following command. The “hdfs” collection gets created, as shown in Figure 1. A Solr core called hdfs_shard1_replica1 gets created implicitly. 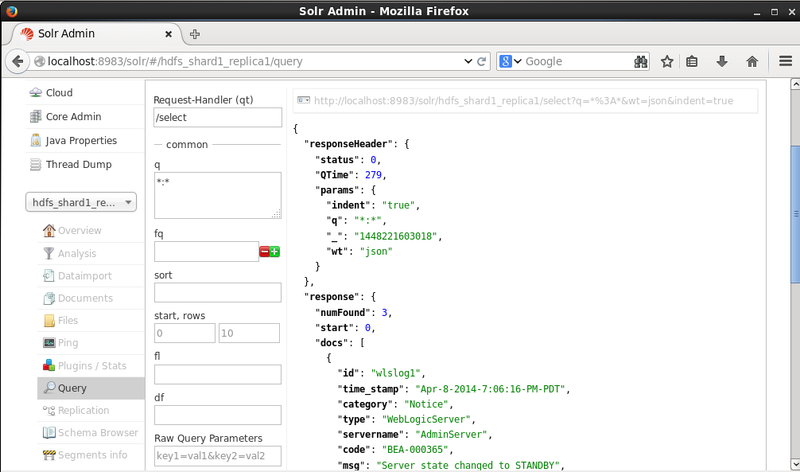 We need to configure the Solr schema for the fields in a Solr document. We shall be using fields time_stamp, category, type, servername, code, and msg. Declare the fields in the schema.xml file in the /solr/solr-5.3.1/server/solr/configsets/basic_configs/conf directory with a <field/> element for each of the fields. Make the fields indexed by setting indexed to true. 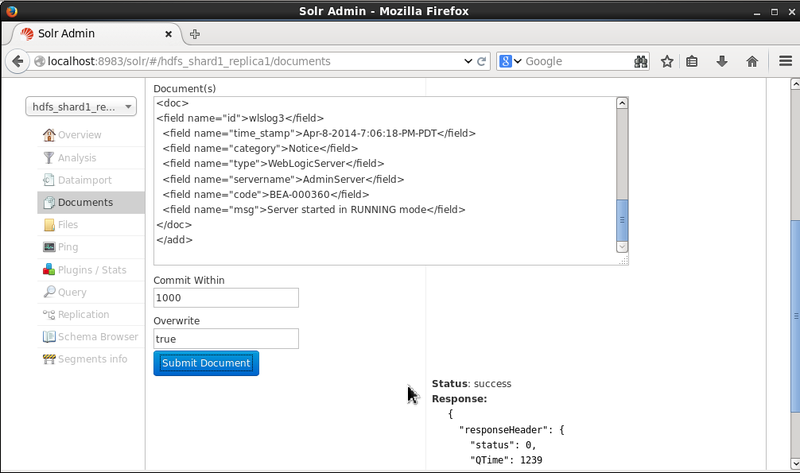 The two fields Solr documents require are the id field and the _version_ field. 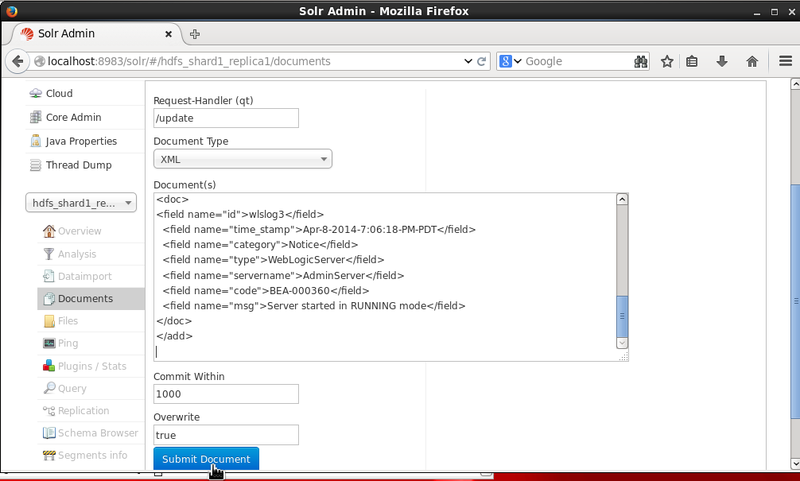 The id field should be provided when a new document is added and the _version_ field is added automatically by the Solr server. Duplicate fields should be removed if any. The only configuration in the solrconfig.xml is to set auto commit to true. To add the Solr dist jars to the runtime classpath of Solr, copy the jars in the dist directory to the lib directory in the Solr instance directory /solr/solr-5.3.1/server/solr/configsets/basic_configs. As we shall be using Apache Hadoop for storage, we need to configure Hadoop, but because only the HDFS is made use of for Solr storage and not the MapReduce, we won’t need to configure the MapReduce. We do need to set the fs.defaultFS and hadoop.tmp.dir configuration properties in the core-site.xml file, the fs.defaultFS being the NameNode URI and the hadoop.tmp.dir the Hadoop temporary directory. The core-site.xml may be edited in the vi editor with the following command. Create the Hadoop directory configured in hadoop.tmp.dir and set its permissions to global (777). We also need to set the following HDFS configuration properties in the hdfs-site.xml file. Permissions checking. Setting to false disables the permissions checking on HDFS files. The chgrp, chown and chmod always check permissions. The hdfs-site.xml may be edited in a vi editor with the following command. Create the NameNode storage directory and set its permissions to global (777). First, format the NameNode storage. After the preceding command exits start the HDFS cluster, which comprises of the NameNode and the DataNode. As we shall be storing Solr data in HDFS we need to create a directory in the HDFS for Solr data. Create the Hive warehouse directory called /solr in HDFS and set its permissions to global (777). The output from the preceding commands is shown in Figure 2. When Solr is started using the default storage we use the following command. When using HDFS storage we shall be using a slightly different command with additional command parameters. 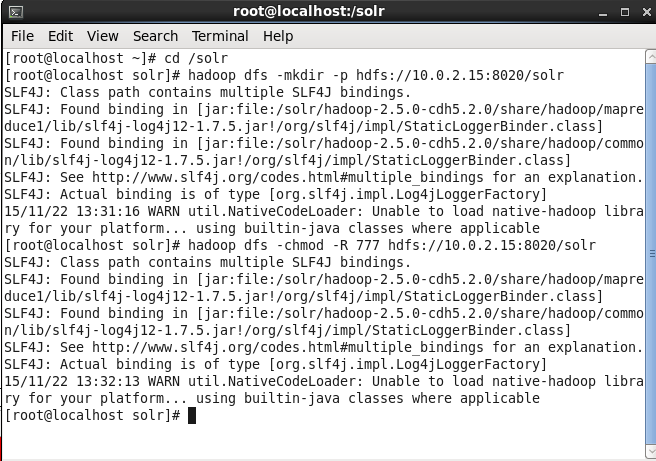 Solr must use the HdfsDirectoryFactory to store data in HDFS. Specify the HDFS directory in which to store data with the solr.hdfs.home property. We also need to specify the locking mechanism to use as hdfs with the solr.lock.type setting. 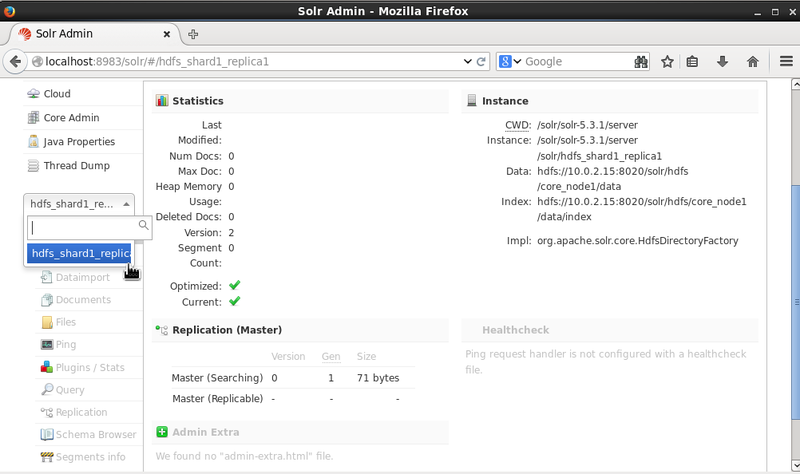 Run the following command to start Apache Solr server using HDFS for storage and indexing. Solr server gets started. 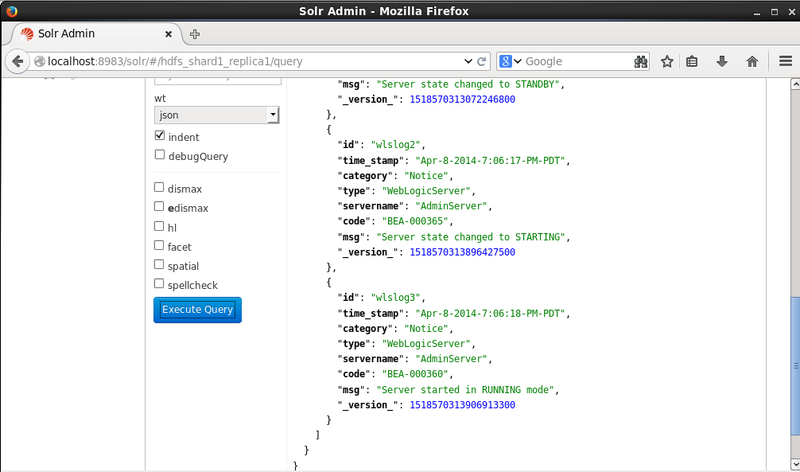 Find the Solr server status with the following command. 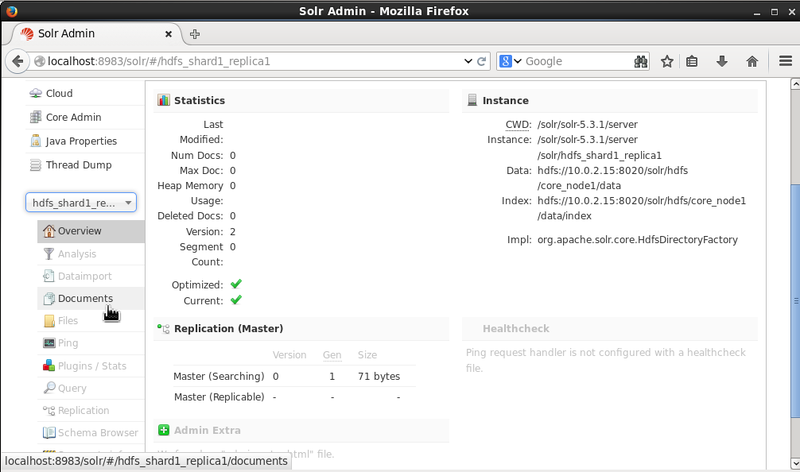 The status lists one Solr node running, as shown in Figure 3. 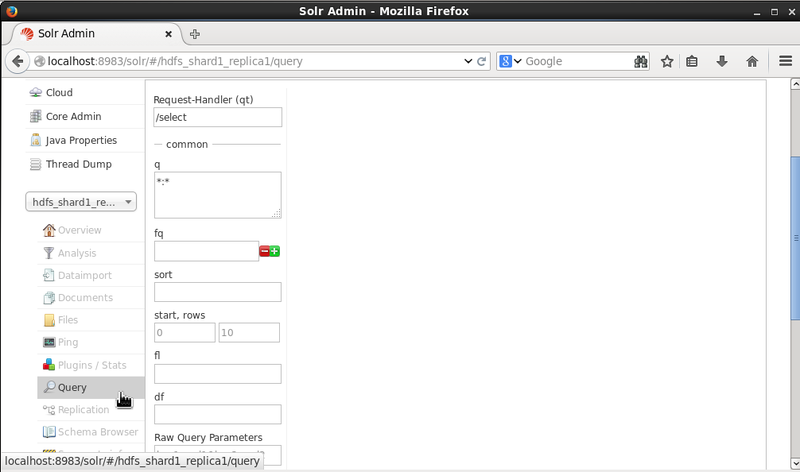 Next, login to the Apache Solr Admin Console using the URL http://localhost:8983/solr/. In the Core selector display the available cores. The hdfs_shard1_replica1 core gets listed, as shown in Figure 4. We shall be indexing log data in XML format with the sample data. Create the following Solr format XML document to add. Select the hdfs_shard1_replica1 core and select Documents as shown in Figure 5. The default Request-Handler is /update. Select Document Type as XML. In the Document (s) field add the XML document. Click on Submit Document as shown in Figure 6. The “success” status shown in Figure 7 indicates that the documents have been indexed (in HDFS). The indexed documents may be searched, just like the documents indexed in the local filesystem. Select Query as shown in Figure 8 and set the Request Handler to /select (the default setting). Using the default query of *:* all the documents indexed would get listed when a query is run. Click on Execute Query as shown in Figure 9. The three documents indexed get listed, as shown in Figure 10. The _version_ field has been added to each document, as shown in Figure 11. 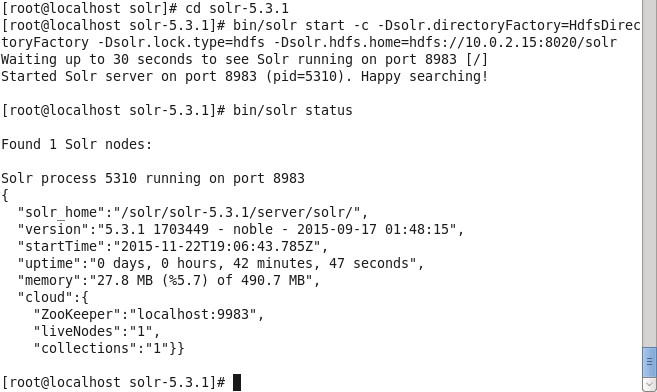 Earlier, we created the /solr directory in HDFS, and specified the directory when starting Solr server. The Solr data gets indexed in the /solr directory. Run the following command to list the files and directories in the HDFS directory /solr. Two items ,“hdfs” and “wlslog”, get listed, as shown in Figure 12. The hdfs directory is for Apache Solt storage on HDFS. The “wlslog” is some other HDFS data storage directory for Solr not used in the tutorial. Run the following command to list the files and directories in the /solr/hdfs directory in HDFS. The /solr/hdfs/core_node1 used for the Solr core in this article gets listed, as shown in Figure 13. In this article we used HDFS, which provides the benefits of reliability and durability in a large scale distributed storage, for indexing Solr data. We installed and configured Apache Hadoop 2x. We started HDFS and created a directory in the HDFS for Solr data. We started Solr server using the HdfsDirectoryFactory and hdfs lock type. 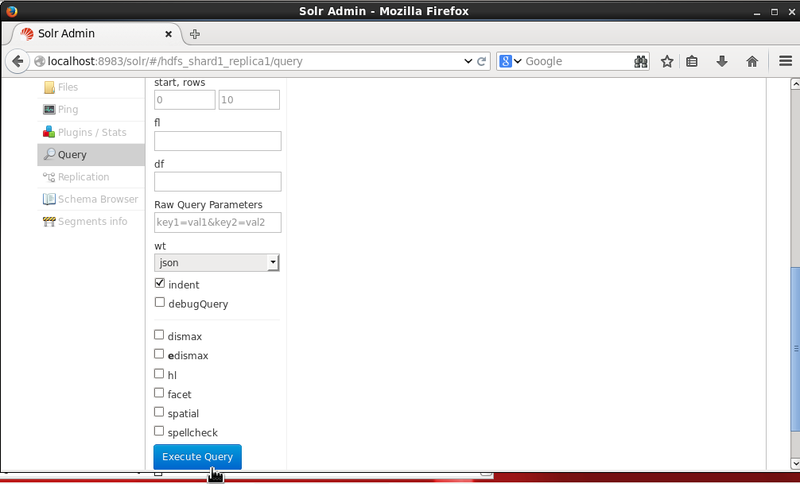 Subsequently we indexed and queried data in Solr from the Solr Admin.